I think those who already hold ofc need not to get confused because the company before promised 200 OFC per ONE and said it is one time offer. So maybe we should be happy we had that offer on table because what will follow from 8th of September should be less OFCs per ONE. For people who are not yet part of OneCoin what options they will have? Can they still purchase the educational packages and accept ONE and then convert to OFC (if they decide) or there will be no more Educational Packages that offer ONEs and they will have to buy OFC packages? This are just my thoughts and confusion based on what i have been informed and read before. to be honest i have been pretty good reading the Onecoin tea leaves over the years and kind of figured there would be a delay after the fake office raid, but now i'm stumped. The big reveal ? what pray-tell could it be ? igor, do you think this has anything to do with OFC's or XCOINX or Neither ? I'm tired of these stupid "big reveal" hype messages. OneCoin is nowadays just one hype and next "big date" after another. Seems it's just for the purpose of keeping people captivated and not losing hope, because the next big reveal is coming(!) Sigh..
And show the goddamn blockchain already. I don't want to read from Konstantin's document some assurances that we have a blockchain. What the hell is that? People I know want to see their coins which are missing due to CoinSafe issue in the blockchain. And I want to see my coins and transactions in it, like with any other crypto coin I have. Why there even needs to be a Coin Offering in the first place? Why not just buy and sell coins from open markets like initially planned? onecointruth, hang in there mate.. the huge buzz i'm hearing in my Asian upline is the DS franchise. they have told me that the entire concept and development is rock solid and is what is needed especially for chinese merchants. what we all want is signs of progress... no more talk. There will be more public info on how public transfer will play out soon. Question is: "what currency will they ask for OFC bundles. ONE, or EUR?" Different answers open different playouts. But more public info will come soon about that. Here are the bundles and how many OFCs you will get with each bundle during the Coin Offering. 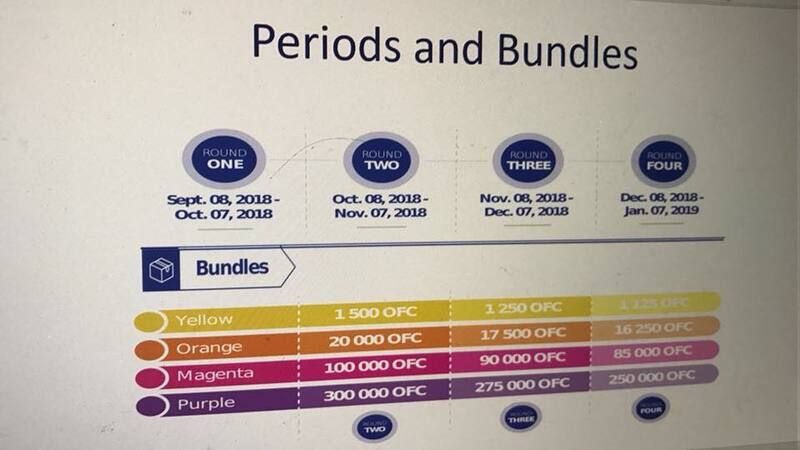 Bundle prices are not yet given, but we can see from the chart how many OFCs each bundle gives during rounds 2,3 and 4. Also we don't know yet what will be the OFC to ONE exchange rate. prices from the first offering which was suspended were i believe. i did not hear konstantine say anything about official date at all. we should not assume anything right now is my guess. the OFC website has not changed and is still stating Oct 8th is the day you can covert OFC's to ONE. I would presume that info would have been updated now if things have changed, but this is Onecoin..... tea leaves man, tea leaves. Actually it says conversion becomes possible after October 8th, so there's no exact date there either. I think it's unlikely the conversion becomes possible before the Coin Offering is over in January. It was also the idea with the original Coin Offering that OFC conversion becomes possible after it's over. If there is some news about this topic, I will update it and reopen it. This lock is not to say that German investigation was finished, it is not, but there are total 187 cases against onecoin worldwide (inside info from legal) and most of them are finished. We already saw one German court rule in favor of onecoin so I think it is not likely that one court or even country will rule in one way, and others in the opposite way. We will see what happens.